Ocean City is Maryland's premiere beach resort and a popular vacation destination. Ten miles of white sand and sparkling water make it so popular that we have created this special guide to Ocean City page. You can make a reservation with a motel in Ocean City, get local information and books about Ocean City, get Ocean City Weather, and even check out the view at the Beach. 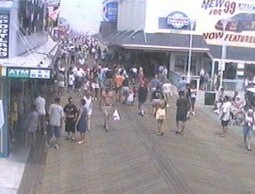 The Ocean City Boardwalk is one of the Ocean City's most popular attractions. The boardwalk runs from the inlet to 27th Street. The boardwalk was recently refurbished and now includes a new gateway arch, new lighting, benches, plants and signs. The old concrete section has been replaced with the more traditional boards. Worcester County offers a free "Beach & Beyond Passport" - a concise guide to day trips within 60 miles of Ocean City, MD. You'll get discounts to attractions, free gifts, and a chance to win a prize. You'll also have a great memento of your trip to take home with you! DelMarVa Low Impact Tourism - promotes the low impact use of Delmarva's natural and cultural resources to enhance local economics and to insure the preservation of our quality of life. The Ocean City Maryland Chamber of Commerce provides a comprehensive guide to Ocean City. You can request a free visitors vacation guide to Ocean City. OceanCity.MD - Ocean City Maryland - Ocean City Hotels, Real Estate, Restaurants. Ocean-City.com - your virtual vacation guide to Ocean City. At The Beach - Maryland - Comprehensive guide for Ocean City, Maryland and inland communities. Beach-Net - a vacation guide to Ocean City and Fenwick Island. Assateague Island National Seashore - barrier island featuring long beaches and extensive marshlands with diverse wildlife, including herds of wild horses. Weekly Fishing Report covering Ocean City, Maryland and the Delaware Beach Resorts along the Atlantic. Endless Golf - what Endless Summer was for surfers, Endless Golf is for hackers.